-- 4 -- In most states with Fair Employment Practices laws, Title VIII requires the Commission to refer your charge to the state agency which has 60 days to try to settle your complaint. You will be notified if this is done, and of your right to come back to the Commission if you are not satisfied with the state action. NOTE: Since July 2, 1967, the law covers employers and unions with 50 or more employees or members. You can help end discrimination by using all of the available legal sources if you have been victimized. The State of Iowa had a Civil Rights Commission which was established in 1965 by an acto of the Sixty - first General Assembly. This Commission receives complaints from individuals aggrieved in matters relating to housing, public accommodations, employment, on-the-job-training programs, apprenticeship programs and vocational schools. Complaints must be notarized and in triplicate. May be filed at the Commission Office in Des Moines by personal delivery or by mail. The office address is: 1209 East Court Suite 306 Des Moines, Iowa State Capitol Building Des Moines, Iowa 50319 The phone is: Area Code 515 - 281-5129 Complaints may be filed with any Commissioner. Complaints must be filed within 90 days after the discriminatory act occurs. 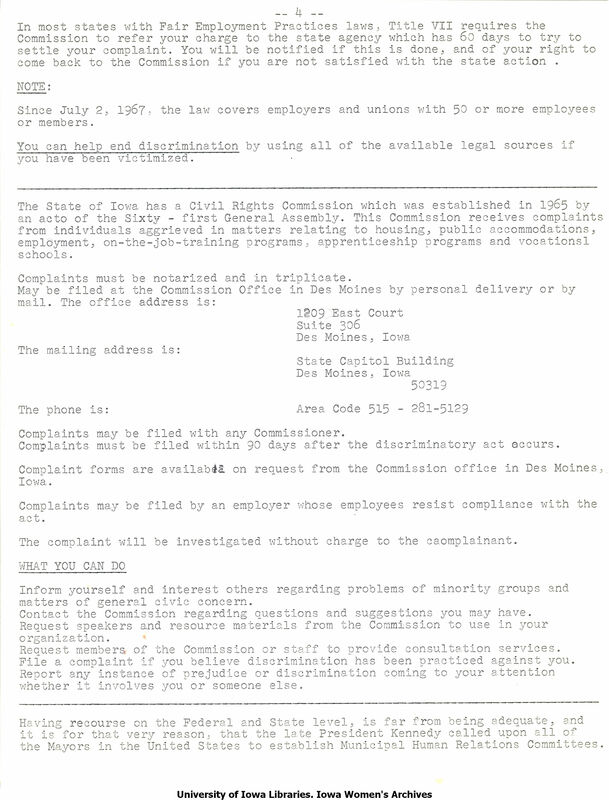 Complaint forms are available on request from the Commission office in Des Moines, Iowa. Complaints may be filed by an employer whose employees resist compliance with the act. The complaint will be investigated without charge to the complainant WHAT CAN YOU DO Inform yourself and interest others regarding problems of minority groups and matters of general civic concern. Contact the Commission regarding questions and suggestions you may have. Request speakers and resource materials from the Commission to use in your organization. Request members of the Commission or staff to provide consultation services. File a complaint if you believe discrimination has been practiced against you. Report any instance of prejudice or discrimination coming to your attention whether it involves you or someone else. Having recourse on the Federal and State level, is far from being adequate, and it is for that very reason, that the late President Kennedy called upon all of the Mayors in the United States to establish Municipal Human Relations Committees. University of Iowa Libraries, Iowa Women's Archives.